This photograph was taken from the road up Signal Mountain. My wife and I were on our honeymoon. We had been up Signal Mountin earlier in the day and seen the spectacular views. I had exposed two negatives, which I suspected would amount only to vacation album snapshots. We were walking out of the restaurant after dinner, and we saw this wonderful light developing to the west, as a thunderstorm cleared. I knew I had to get back to Signal Mountain in a hurry. As I recall, we were driving 60 mph in a 40mph speed zone. I definitely do not recommend this. It is very dangerous on a winding road bordered by big trees, used by many other cars, and crossed by much wildlife. 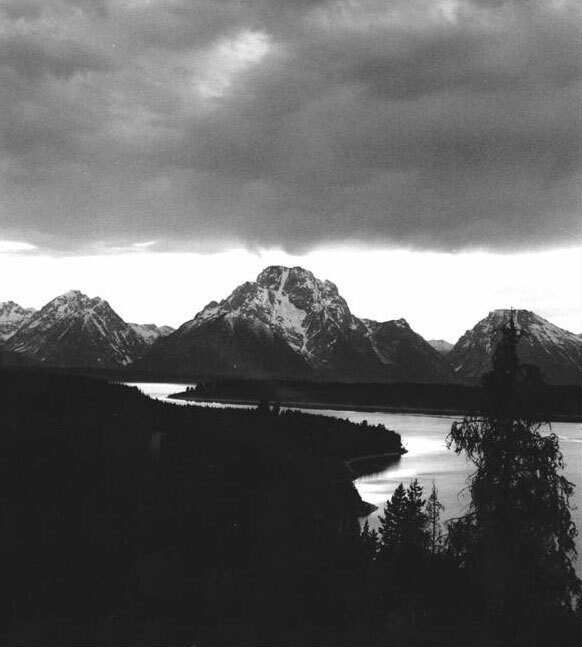 It also is a desecration of a special place like Grand Teton National Park. Fortunately, we arrived unhurt and just in time to take this photograph of light pouring out of the sky and into Jackson Lake.